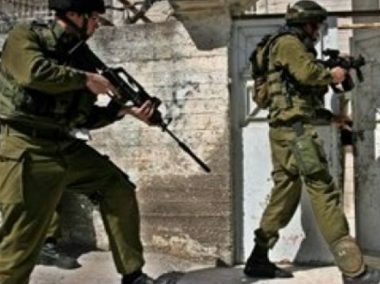 Israeli forces invaded al-Biereh City, east of the occupied central West Bank City of Ramallah, on Saturday evening, and assaulted Palestinian youth. Soldiers attacked al-Biereh City, shooting rubber-coated steel bullets, and tear-gas bombs, locals told Ma’an News Agency, apparently directing their aim at the Palestinian youth. The occupation forces observed 2 children, Muhammad Anwar Abu Muslem, 8, and Mahmoud Bassam Abu Muslem, playing in front of their home, assaulted the boys, and abducted them, taking them to the illegal settlement Psegot, built on Palestinian land. Addameer prisoners’ rights group states that 5,440 Palestinian prisoners are incarcerated in Israeli jails, 209 of whom are minors (less than 18 years), including 46 of whom are younger than 16 years of age. International Law states that it is prohibited for the occupying force to transfer civilians onto occupied territories; see 4th Geneva Convention, article 49.